I like the neckline, the color scheme, the hijab is tied very neatly, it is a nice outfit masha'Allah! 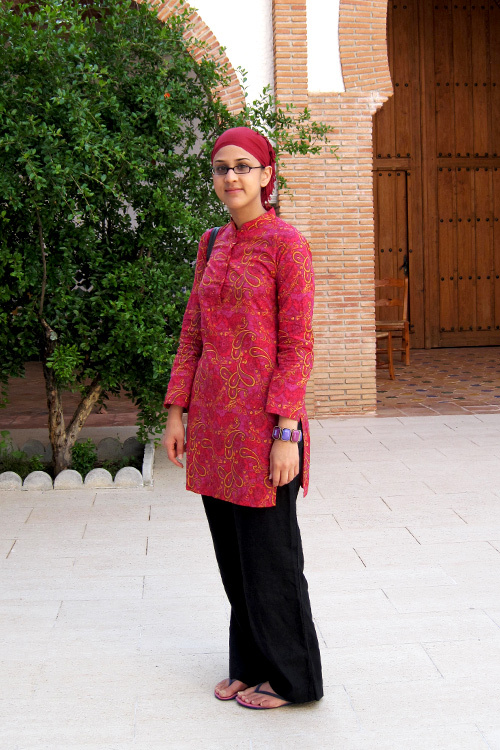 a very pretty tunic, mashallah! So pink and girly! Lov it! OMGOSH I love this clothes :D:D... awesome looking mashAllah!!.... I could marry that shirt. lol :P.. I'm sorry to ask, but I noticed 2 girls from the same place don't cover their necks.. is there a reason or it's just a coincidence? very, very adorable look, mA! love it! Have you ever been to Spain during the summer? Though these sisters look incredibly fresh and cool-- Spain in the summer is scorchingly hot!!!! Oh my goodness, they are showing their neck...call the haram police! Come on ladies, there is more than one way to wear hijab!